FIFA 18 European Team of the Tournaments cards are awarded in FUT 18 to the most informed players from the European Clubs competitions. Let’s find out who received a TOTT item. 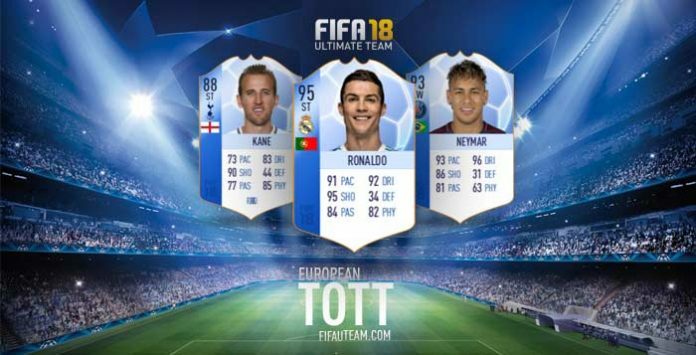 The TOTT cards celebrate the player performances from Europe’s biggest club competitions: The Champions League and the Europa League. They are released two times: the Team of the Group Stage and the Team of the Knockout Stage. You will be able to find these cards in packs or on the transfer market, just like the TOTW cards of those weeks. 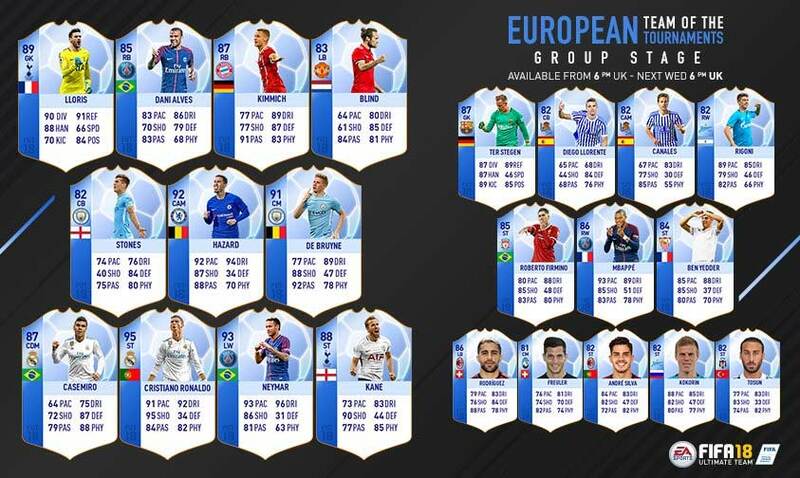 The FIFA 18 European Team of the Tournament Cards become available in packs for one week. During this period, they replace the corresponding regular cards. In other words, in the day a player gets his TOTGS or TOTKS card in packs, it is impossible to find his regular card there. Your odds of pulling a TOTT card from a pack are exactly the same of pulling the regular card of that player in another day. For the first time ever, the OTW cards are affected by the TOTT. It means that this year, there will be much more people interested in knowing who will make this team. Starting December 8, for only a week, these 23 players will be available in packs as special TOTT items. In May, a new TOTT will be released featuring a selection of the best players from the Champions League and Europa League knockout stages.